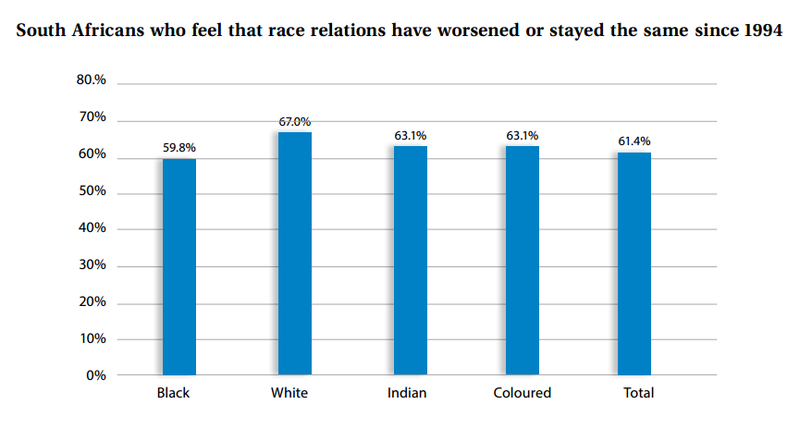 A new poll conducted by the The Institute for Justice and Reconciliation (IJR), finds that most South Africans believe that racial relations have worsened, or stayed the same since the end of apartheid. conducted by the IJR, obtained a sample of 2,219 respondents. It found that a majority of respondents (61.4%) feel that race relations since 1994 have either stayed the same or deteriorated. South Africans generally believe that the country has made progress on the road to national reconciliation since the end of apartheid (59.2%), and believe that the country has to pursue it as a national objective (69.7%). 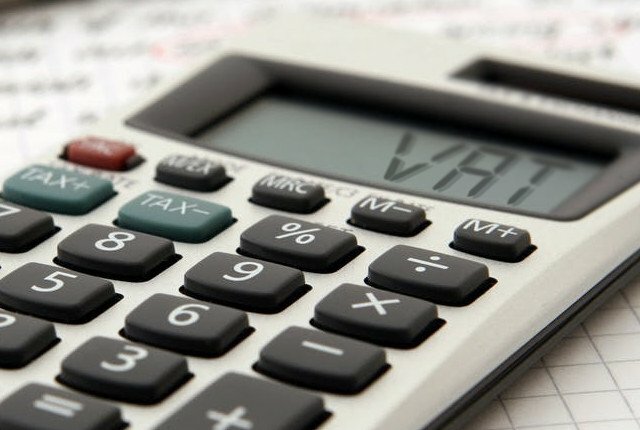 Most believe that it is impossible to achieve a reconciled society for as long as those who were disadvantaged under apartheid remain poor within the ‘new South Africa’. 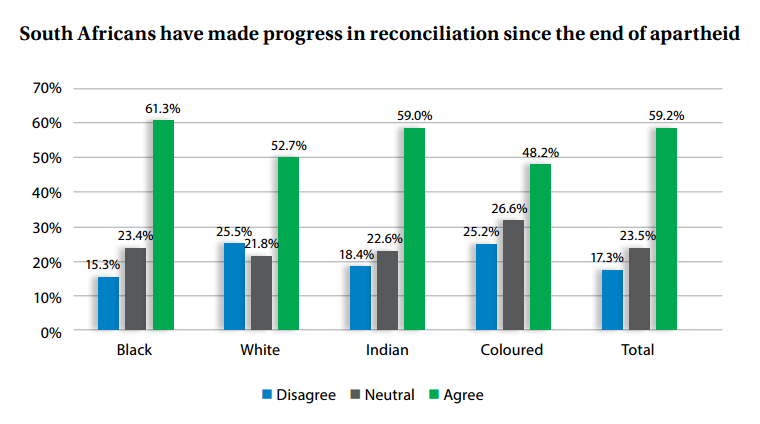 More black South Africans (61.3%) believe that the country has made progress in reconciliation since 1994. This demographic is followed by Indian respondents (59%) and white respondents (52.7%). surveyed indicated that the country has made headway on the road to reconciliation. Only a third (35.6%) of the sample indicated that they experience no racism in their daily lives. 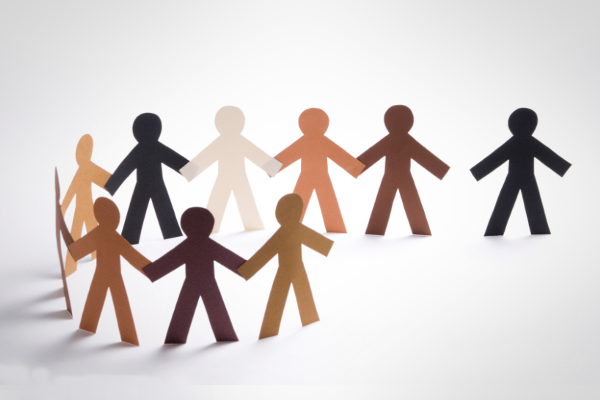 Moreover, trust between the country’s historically defined racial groups remains low – 67.3% of all respondents noted that they have little to no trust in their fellow citizens of other racial groups. 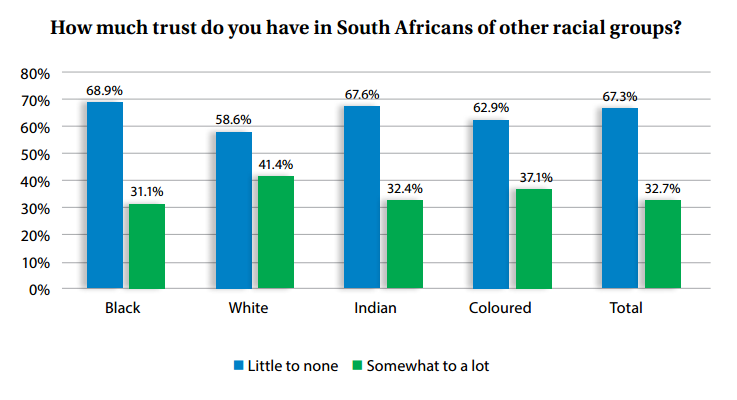 White (43.5%) and coloured South African (46.1%) respondents recorded the highest percentages for individual groups who say they never experience racism in their daily lives. On the other end of the spectrum, 11.9% of the total sample of respondents reported that they experience racism all or most of the time. Black respondents (13%) were most likely to respond in this way, followed by Indian (9.9%), white (8.8%) and coloured (8.8%) respondents. 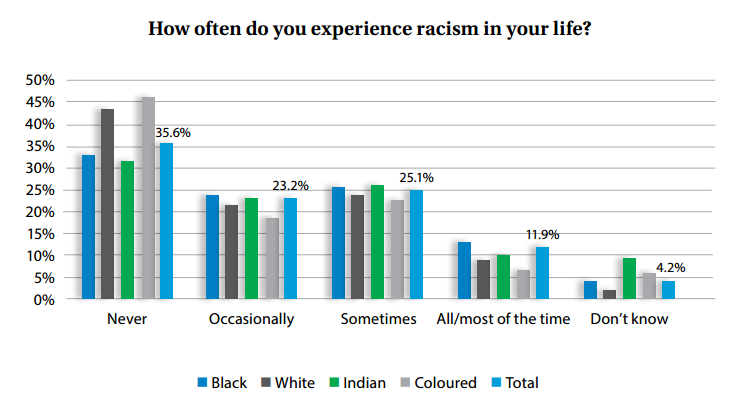 If all reported cases of racism are added up, IJR noted that 60.2% of all respondents have reported varying degrees of experience of racism in South Africa. Amongst individual racial categories, this figure is highest for black South Africans (62.4%) and lowest for white South Africans (54.1%). Most interracial interaction between South Africans occurs in public spaces, such as places of work and study and shopping centres, the poll found. Interaction in more intimate spaces, such as private homes and social or communal gatherings, is limited. Citizens who are materially better off report higher levels of interracial interaction than those who are worse off, the barometer found. groups, 75.5% of respondents noted that they regard being South African as a very important part of their identity. 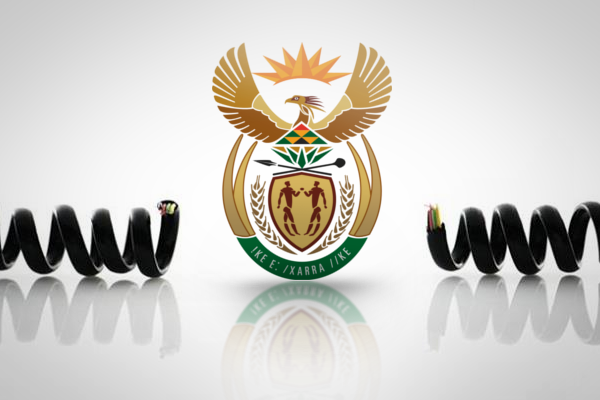 “Legislation is no longer required to sustain apartheid. It has evolved in ways that allow it to sustain itself up to the present day,” the report said. While material inequities as tangible and incontrovertible manifestations of apartheid’s legacy have received their due attention in our public discourse over the past two decades, many have preferred to gloss over the persistence of racial prejudice that they continued to reproduce. “But the country’s reluctance to confront this in a forthright manner has caught up with it. Many, today, experience a sense of deep social polarisation in which our separateness reinforces racial prejudice,” IJR said.